Image © Stuart Moore & June Brigman. Written by Stuart Moore, art by June Brigman and Roy Richardson, colors by Veronica Gandini, letters by Jimmy Betancourt of Comicraft. NOTE: I designed the logo for this and other Ahoy comics, so I wish them well. The situation reveals itself on the cover: human-like cats (and cat-like cats) in space. As the issue begins, they are in a desperate battle with an alien enemy force, The Lumen, who have already wiped out all the humans in this galaxy, and are now intent on doing the same to the cats. Captain Ginger’s crew consists of scrappy battle veteran Sergeant Mittens, a hairless, queasy science-officer, pregnant engineer Ramscoop, stylish parts and food fabricator Ecru, and more. They’ve taken over the once human-manned ship, gradually figured out how to run it, and worked out a plan of action together to save themselves from certain destruction. What’s wrong with this picture? For one thing, cats don’t work together. But then, as these are evolved human-like cats, you have to give writer Stuart Moore a chance to make his case, and it’s one of the main themes of the book. 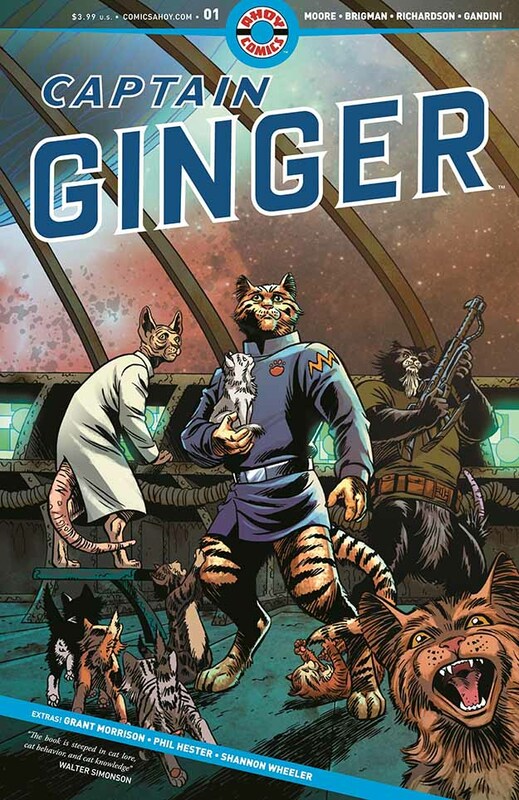 When the ship lands on a supply station and most of the crew wants to stay there, Captain Ginger has his paws full trying to herd his crew back into line. Additional clues can be found in the backup text piece, and there’s plenty more to come, I’m sure. It’s a good start with great art by June and Richard, and enough humor to make it a fun read. The backup text piece in this comic by Grant Morrison about Ben Franklin did not work for me, but then you can’t have everything. Also here is a text piece by Moore and a brief interview with June Brigman. This entry was posted in Comics, Reviews on October 28, 2018 by Todd.